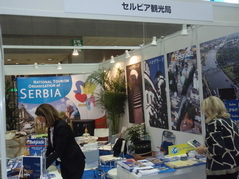 From December 21, Japan - Serbia Cultural Exchange Association, the Embassy of Serbia in Japan and the company "Adria International Co. Ltd." opened this year's Serbian Charity Fair, that will offer a wide variety of best quality Serbian wines, spirits, home made fruit preserves, traditional handicrafts and souvenirs. Representatives of the Embassy and members of the Association were present at the opening ceremony on December 20th. This is unique opportunity for everyone interested to purchase some Serbian products, which are not yet available at the Japanese market. As part of annual consultations on consular issues, Ambassador Mrkić and Deputy for Consular Affairs Ms. Kovač paid a visit to Honorary Consul General, Mr. Naohide Ueyama, in the premises situated in "Dainihon Jochugiku" Company (better known as Kincho) in Osaka. They also had an opportunity to meet with other high representatives of this respectable company, Mr. Hidesuke Ueyama, Chairman, Mr. Hisashi Ueyama, Senior managing Director, and Mr.Takashi Hasegawa, General Manager. In Kyoto, Ambassador Mrkić met with Prof. dr Shin-ichi Kanemaru, from Graduate School of Medicine in Kyoto University, who was last year awarded with the Embassy's acknowledgements for his expertise and succesful treatment of Serbian patient. 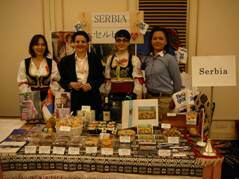 Serbian Embassy participated in this year's bigest annual International Charity Fair and Ikebana Exhibition, held in Tokyo Prince Hotel on December 10. In this event, supported by its Honorary President H.I.H. Princess Takamado, 45 countries presented their products and delicacies. During her visit to our booth, H.I.H. Princess Takamado showed her interest in some of Serbian traditional food. Mrs. Ivona Mrkić, the wife of the Ambassador, presented to H.I.H. 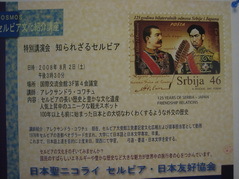 Princess Takamado the envelope "First Day", issued in 2007 on the occasion of Emperor's 74th birthday and of marking 125th anniversary of bilateral diplomatic correspondance between King of Serbia, Milan I Obrenović, and the Emperor of Japan. We are proud to say that many guests at the fair were interested to know more about our country and purchase our products, which were sold out. This way, we hope we demonstrated simbolically our gratitude for long standing Japanese aid support, by donating our bazaar earnings to be used for people in need through the humanitarian efforts of Japanese volunteers. Lidija Radovanov, ballet dancer from Serbian National Theatre in Novi Sad, was invited to appear in one of leading roles in special Christmas ballet perfomance of Tchaikovsky's "The Nutcracker" in Tokyo. It was a great pleasure watching the ballet, choregraphed by Suwako Tago, and followed by the orchestra, at U Port Hall in Gotanda. Head of Cultural Section at the Serbian Embassy Ms. Kovač with ballerina Radovanov and the Mrs. Hayase and Mr. Yamamoto from Beato Music Inc. In ACC Headquarters in Tokyo, the organization held their annual Christmas Charity Fair during which the hand made products by internally displaced women from Serbian province of Kosovo and Metohija were sold. Director Matsunaga visited us with one of her activists from Hyogo prefecture, Yoshiki Moriyama, who recently wrote his impressions during and after his visits to Serbia, displaying unusually deep understanding and interest in ongoing situation. Ambassador Mrkić with his wife were invited to the Imperial Estate for Duck Netting Event, traditionally held on the occasion of Siberian and Alaskan wild duck migration. His Imperial Majesty the Emperor of Japan has organized a special shelter for these migratory birds on his estate and now the representatives of diplomatic corps are invited each year to participate in the event aiming for their preservation and protection. Japanese film distributor and filmmaking company "Desperado Inc." held a pre-screening of Kusturica's movie "Promise me this" in Tokyo. Before the nationwide release, the company will show it next spring at the "Cinema Rise" in Shibuya (http://www.cinemarise.com/), the same place where Kusturica was introduced to Japanese audience for the first time with his big hit "Underground". The international gathering of legal experts on trade law was held in Tokyo on November 19th for the purpose of improvement of international regulations within UNCITRAL. 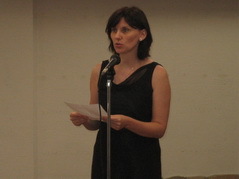 Representative of Law School of Belgrade University was Mrs. Milena Đorđević, Assistant Professor. On the invitation by Kodaira UNESCO Association, representatives of our Embassy introduced Serbian traditions through workshop and presentation. Around 40 members of Association, among which some had already been to our country, enjoyed the recipes of traditional Serbian dishes, fruit jams and wine in jointly organized workshop. The taste of Serbian cuisine was highlighted later with the talk about its famous cultural and historical heritage and touristic attractions. Dear and great friend of Serbia, Dr Shosaku Tokunaga, who has been the President of Japan-Serbia Friendship Association for many years, passed away on November 3, 2008. With his continuous and sincere effort, Dr Tokunaga contributed to the further strengthening of friendship between people of Serbia and Japan, leaving unforgettable and permanent imprint in the history of our relations. At the same time, as a Professor of the University in Sapporo who received his PhD in Belgrade, dr Tokunaga contributed to the establishment of lasting academic and intelectual ties with Serbia, and deepening of broader understanding and appreciation for our history and cultural heritage in Japan. 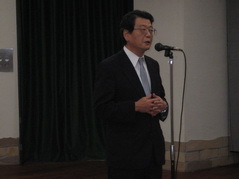 Following the decision of the Government of Serbia to return ambassadors accredited to the countries that recognized unilaterally proclaimed independence of Serbian province of Kosovo and Metohija to their posts after they were recalled for consultations, Ambassador Extraordinary and Plenipotentiary of the Republic of Serbia to Japan, H.E. Mr. Ivan Mrkic returned to Tokyo on October 29, 2008 and resumed charge of the Embassy. On October 23, 2008 Charge d'Affaires a.i. Mrs. Snezana Jankovic gave lecture about EU integration of Serbia and its position regarding Kosovo and Metohija at the Aoyama Gakuin University. Mrs. Jankovic explained to the students of this university about Serbian efforts to join EU and its diplomatic and legal strife to maintain its territorial integrity and sovereignty. 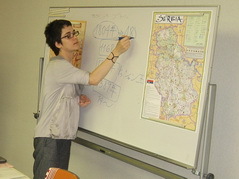 She informed them about the success of the recent Serbian initiative in the UN General Assembly to request opinion of the International Court of Justice about legality of the unilaterally proclaimed independence of Serbian Province of Kosovo and Metohija and pointed out possible consequences of Kosovo's secession for the world peace and stability. Rector of the University of Belgrade, Prof. Dr. Branko Kovacevic and State Secretary of the Ministry of Science and Technological Development of Serbia Prof. Dr. Snezana Pajovic participated in this year's Science and Technology in Society Forum in Kyoto. Dr. Pajovic took part in the Ministers' round table meeting, presided by H. E. Ms. Seiko Noda, State Minister in charge of Science and Technology Policy, while Rector Kovacevic participated in the Rectors' Meeting, chaired by the President of the University of Tokyo. Along with numerous discussions at the Forum, Rector Kovacevic and State Secretary Pajovic held a number of bilateral meetings with the Japanese and foreign officials and scientists on future scientific cooperation. Rector of the Belgrade University, Prof. Dr. Branko Kovacevic, who participated in the annual Science and Technology in Society Forum in Kyoto (October 5 - 7), met with the Vice President of the Osaka University, Prof. Dr. Kiichiro Tsuji. Vice President Tsuji expressed their readiness to enchance the cooperation with Belgrade University and sign bilateral Memorandum of Understanding in the near future. He was invited to participate in the international rector conference in April 2009 in Belgrade, as a part of the Universiade event that will be organized there in summer next year. Rector Kovačević also met with Dr. Kunioki Mima, Director of the Institute for Laser Engineering (ILE), who has a succesful and long term collaboration with Serbian Institute "Vinča" and visited the Institute premises. 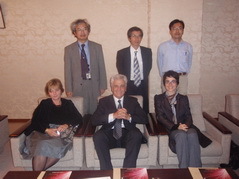 This is second visit of Rector Kovačević to Japan, who previously had meetings with the ITO, Nippon and Tokyo Foundations and participated at International Conference IPSI in Tokyo in May - June last year (for details, please see the news for May - June 2007). On the occasion of the Art Exhibition by Parliamentarians, Businessmen and Artists, held on September 29, 2008, Ambassador Takehiro Togo, President of the Japan - Serbia Exchange Association, won the prize of the Vice Chairman of the Exhibition, for his painting of the famous Kalemegdan Fortress in Belgrade. Ambassador Togo, who visits Serbia frequently, was impressed by this centuries old fortress with the view of Danube and Sava Rivers, whose beauty he successfully depicted in his painting. Ambassador Takehiro Togo, Mrs. Ivona Mrkic, wife of Ambassador of Serbia to Japan, H. E. Mr. Ivan Mrkic and Snezana Jankovic, Charge d’Affaires a.i. 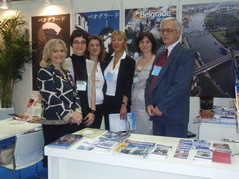 For the third consecutive year Serbia is participating at the JATA World Tourism Congress & Travel Fair at Tokyo Big Sight (http://www.jata-wtf.com), which is one of the biggest international fairs in Asia. Openning reception was held on September 19, with great number of Japanese tourism institutions and agencies, media and diplomatic corps present at the event. The representatives of the Tourism Organization of Serbia (TOS) Mr. Predrag Rolović and of the Tourism Organization of Belgrade (TOB) Ms. Ljiljana Alajbegović and Ms. Dragana Babović, will introduce diverse touristic offers from Serbia, which include some new initiatives like congress tourism and birthplaces of Roman emperors. Private travel agency from Serbia "Glob Metropoliten Tours", with more than 10 years of successful working experience with tourists from around the world, will be participating at the fair for the first time. Please join us and learn more about Serbia. Viktor Mitić, artist from Serbia, will exhibit his newest abstract paintings in collaboration with Malaysian artist Chew Kiat-Lim at Ginza Muromatsu Gallery between September 08 - 13, 2008. Mitić, mainly working in Canada where he now resides, will introduce his challenging oil-on-canvas art experiments for the first time to Japanese visitors. For details about exhibition, please see the flayer as well as the following link of the gallery's web site: http://www.muramatsugallery.co.jp/schedule.html. Prof. Branko Pavić, Serbian visual artist and art lecturer at the Faculty of Architecture and Art University in Belgrade, will be participating in the "12th Nagasawa Art Park Artist-in-Residence" project in Hyogo Prefecture, from August 25 till October 18, 2008. The program, which started in 1997, involves various artists from around the world to reside in rural area in Awaji island for around two months and undertake training in water base printmaking. During the program, there will be an open studio day organized for visitors interested to see the art process and artworks. For details, please visit http://www.endeavor.or.jp/nap/. On invitation by the Association of Serbian - Japanese Friendship "Saint Nicholas from Japan" head of Cultural Affairs Section Ms. A. Kovač held a presentation about Serbia in Kyoto Community House on August 2nd (Saturday). 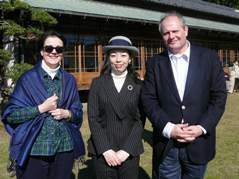 Ms. Kovač introduced Serbian history, cultural heritage and customs, and discovered some interesting tourist attractions and less known moments in the relations with Japan. This lecture is a part of ongoing programme, initiated and organized by friendship association, aimed to provide more useful informations about Serbia and introduce its culture, history etc. The events are organized twice a month, every first and third Saturday, in the premises of "Kyoto International Community House", Kyoto City International Foundation (http://www.kcif.or.jp). Well known Serbian illustrator and Belgrade Art University Professor, Rastko Ćirić (http://www.rastkociric.com/), will be coming to Japan as the member of International Jury at the 12th International Animation Film Festival in Hiroshima (http://hiroanim.org/), from August 7 - 11. During the Festival, Prof. Ćirić will open a special exhibition of his artworks (http://hiroanim.org/en/e02program/2-01_en.html) and there will be a screening of his animation organized on the last day at 2.30 pm. For details, please check the Festival's website. Predrag Delibasic, Serbian musician from Australia, is having several concerts in Japan under the name of Gutter Guitar, together with two other artists Stina Thomas and Chris Cobilis. His music is dominated by the guitar improvisations (to hear the sample, please visit http://www.myspace.com/gutterguitar). The concerts will be organized in several places in and around Tokyo, like Em Seven in Koiwa, Penguin House, UFO Club in Koenji and Flat + RinkyDink Studio. For program, click here. For the forth and last time the touring exhibition of Serbian Naive Art from the collection of International Ethno Center Babka Kovačica has been opened to the Japanese public. This time the opening took place in the Tama Art University Museum on July 27, where it will be available for the viewers until September 14th. Like in previous installations, apart from art work by naive painters, the visitors will have the opportunity to purchase beautiful brochures on naive art and Serbian hand-crafts. 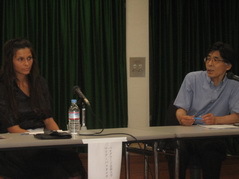 On the first day of the exhibition, about 100 people gathered to attend lively discussion about Serbian history and culture, with the focus on the roots and development of naive art in Serbia, by Ms. Marja Bastajić, art historian and coordinator for UNESCO Culture Management Policy Course at Art University in Serbia, and Prof. Dr Nobuhiro Shiba from Tokyo University, acting also as Secretary General of Japan - Serbia Association. After the discussion, coctail was held for the guests from the Embassy, Japan - Serbia Association for Cooperation, Japan Naive Art Association, media and various academic and art circles, to mark this special moment in final stage of two-year project of collaboration. For the occasion, the speeches were given by Mr. Naohide Ueyama, Honorary Consul General of Serbia in Osaka, Mr. Takehiro Togo, President of Association for Cooperation Japan - Serbia, Mr. Toshiaki Minemura, Director of the Museum and Mrs. Snežana Janković, Charge d'Affaires a.i. of the Serbian Embassy. 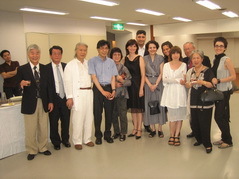 The organizers of this event are Ethno Center Babka and Association for Cooperation Japan - Serbia, with the support of the Japanese institutions and organizations (UNESCO Associations of Japan, Meguro UNESCO Association, Association of Naive Art of Japan) and Serbian institutions (Government of Serbia, Ministry of Culture of Serbia, Ministry of Foreign Affairs of Serbia, Honorary Consulate General in Osaka and this Embassy). For the program of exhibition, please visit web site of the Tama museum. Don't miss the opportunity to visit the concert of Miško Plavi, musician and composer of film music from Serbia, who will be coming again from August 9th till 23rd for series of concerts around Japan, including Tokyo, Osaka, Kyoto, Fukuoka, Hiroshima, Nagoya etc. This time, he will be accompanied with two members of his bend "Miško Plavi Trio". Last year Miško Plavi released highly praised album "Super Best of Miško Plavi" as his first Japanese edition, and had a promotion concert in our Embassy, where he presented his amazing skills and talent. To see the last year event, please see here. For the concert schedule and venues, please see press release and web site of the organizer JABUP. Little Theatre "Duško Radović", one od the most respectable theatres in Serbia for children and young audence, will participate on July 19th and 20th in the International Festival for Young Audience "Kijimuna Festa 2008" in Okinawa (July 19-27th ). "Duško Radović" will perform Danish-Serbian children's theatre coproduction "The Stone Prince", based on the book by Elgard Jonssona "Galefyrsten", which represents the story about isolation of its main character. Their participation is supported by the Secretariat for Culture of City of Belgrade, Ministry of Foreign Affairs of Republic of Serbia and this Embassy. For further information, please check the web site of the Festival and Little Theater from Serbia.